The Richer Life Experience is for people who have always wanted to increase their net-worth, live their passion and create the life of their dreams. 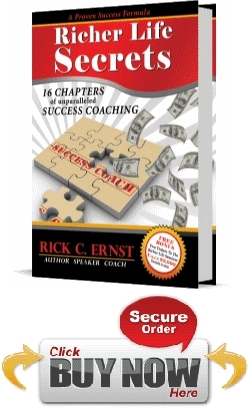 and hear Dr. Rick C. Ernst LIVE as he expands upon the success concepts in his bestselling book Richer Life Secrets. Act Now! For a very limited time, every individual book purchased will include 2 FREE tickets to the Richer Life Experience for a total value of $3000. To attend this celebrated three day event simply purchase the book Richer Life Secrets. “Richer Life Secrets is a fabulous book that sets the new bar for self-improvement literature. Yes for many people things are tough out there. 401Ks have shrunk. Stocks have nose-dived. Unemployment is soaring. Don’t let circumstances take control of your financial future. You can be in the driver’s seat when it comes to this current economy and how it will affect your family. 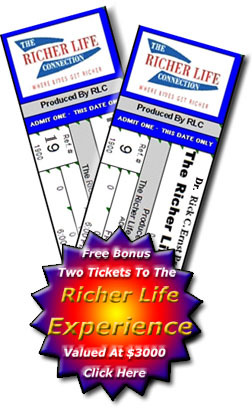 The Richer Life Experience is a dynamic, life-changing, personal growth live event you will receive today’s most current life success coaching and wealth building techniques, concepts and principles to enhance your personal effectiveness allowing you to develop and maintain your winning edge for enjoying the Richer Life. Once you complete this interactive and high impact adventure you will have an enlightened consciousness and be empowered to create new and unique solutions to previously unsolvable problems from an entirely new perspective thereby opening new possibilities and winning opportunities. not only does he live these principles every day, but he gives credit for his success to his Redeemer. “Richer Life Secrets book is an *URGENT* Must Read for YOU! Rick Ernst lays out the *exact* Foundational Success Principles that Will empower you to literally explode to a New Level in Life. Your Life will Absolutely Change forever! are ready to live the richer life, you are ready for this book. This book sets the standard for all personal development books to follow! you forward to heights you only dreamed of before now. “Powerful in its message, life-changing in its scope, the depth of understanding of what success really means reveals the heart and soul of Rick Ernst. “The global market is glutted with books on financial success – how to become rich, how to be monetarily successful and affluent. Dr. Rick’s book reaches far beyond this outlook and addresses the profound need for each of us to find our life’s dream, our abilities to overcome hardship, to persevere, to find the discipline to accomplish our personal vision and make ourselves better human beings. Just as a great athlete requires an insightful and challenging coach with strategies to achieve their goal; so do, all of us need coaching to achieve our life goals. Dr. Rick’s book provides tools and wisdom to compel us to excel and achieve our dreams and to find meaning and purpose to life!